The secret is out, again. Yes, to be insanely successful requires only one word – ‘Process’! With the instant gratification generation now in full swing it is easy to just expect success because that is what ‘I am entitled to’. Common modern day discussions are that “I do not have time to build credibility, systems, or partnerships; I just want the end result now”. The end result being cash, cars, and ego. However this is short lived without process. I am going to share with you how process can transform even the worst performing business into an insanely successful business. We are very fortunate to see this first hand with the customers we work with turning their businesses around simply through implementing the required processes. This is where the true magic is in any business that has delivered long term sustainable success. Most businesses fail to become successful due to a general lack of focus. This lack of focus always starts and stops with the business owner’s lack of confidence in their own decision making. This lack of confidence often sees decisions being changed quickly due to hitting some turbulence, panic sets in. So the question you ask, where does the confidence come from? The answer, process. Successful businessmen build confidence through focusing on process. Here is our success cycle guaranteed. Owner focus on the ‘Process’ – Using business intelligence (sales and profit data, productivity and capacity data) the owner makes educated business decision in terms of what process requires investment to develop. Identify the right process to improve today, to ensure meet the demands of tomorrow. Owner takes care of the process, the secret to any insanely successful business. Process focus on the ‘Team’ – Based on the vision and purpose of the company all processes must be designed to deliver consistency across all areas of the business. This includes marketing, sales, recruitment, onsite, accounts, and reporting. Process takes care of the team through providing the required support and structure to be successful in their individual roles. Team focus on the ‘Customer’ – Process allows the team to 100% focus on the customer. The team is inspired to achieve the business purpose and deliver the customer promise. Team takes care of the customer through being focused to exceed customer expectations. Customer focus on the ‘Business’ – Consistently delivering on the customer promise creates very happy customers. These customers take care of the business through becoming brand advocates spreading the good word to build referral business. Business focus on the ‘Owner’ – A business delivering consistent successful results provides personal wealth and lifestyle for the owner. Business takes care of the owner through a healthy return on investment. The owner is excited and prepared to further invest in the process! 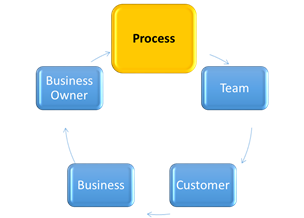 If you are a business owner whose goal is to build a business that can be operated under management, without the day to day input from the owner, then simply focus on process. Process sets business owners free from having to work in the business 24/7. Priority is to be operate in a ‘business mindset’ so you clearly understand the importance of why you must invest in the process today to reap the long term benefits. There is no quick fix to sustainable success. Get focused on the key processes that drive business value. Get team buy in to assist with all process development. Continual review and improvement of all processes.